The seven-time series champion defeated stiff competition and Mother Nature to capture his second win in-a-row at Weedsport, and his season-leading seventh checkered flag of the season. "I got all the faith in the world in this race team - Tony [Stewart] has assembled an awesome group of guys," Schatz said, as raindrops started to fall from the sky. "These guys are unbelievable and we have a lot of fun together. I'm sure they're ready to get off the east coast because I have been riding in the truck with them and I think they're ready to get rid of me for a while and have a break." Schuchart, who already has one second-place finish this season in the Ocean Outlaw Showdown at Ocean Speedway on April 1, once again finished in the runner-up position, just shy of the illusive first series win. "I just didn't have the car at the end, we started to get too loose," Schuchart said. "It's a great run, the guys did a great job. We came up one spot short but it's nothing to hang our heads about. We have a great team and we're learning - but we're a little disappointed. "There's a great group of people that get us here and sooner or later we are going to get them in victory lane." To start the night, a threat of rain loomed over the track located just outside of Syracuse, N.Y., as drivers, teams and series officials watched the weather forecast with hopes of escaping a second straight rainout. Luckily, Mother Nature decided to spare the World of Outlaws, as the night kicked-off with a bang as 23 of 27 drivers qualifyied under the previous track record of 13.401 seconds set by Greg Hodnett last year. Joey Saldana, for the second race in-a-row, set quick-time and established a new track record of 12.274 seconds. Schuchart, in the Mark Pell Tire Service/Marty Thompson Investments No. 1S, set the third fastest time, placing him in the first starting position for heat three. Schuchart dominated his heat to transfer to the dash, in which he started second after a four was drawn for the invert. The Shark Racing driver wasted to time finding his way to the front of the dash, as he worked his way around pole-sitter Daryn Pittman to take the lead, and the victory, in the six-lap race. Schuchart took the green flag for the 35-lap feature from the pole-position and easily pulled away from the field. Even after a rash of early-race cautions, Schuchart appeared to have the car to beat. All the while, Schatz, in the Bad Boy/Chevrolet Performance No. 15 lurked. Schatz started the feature in the ninth position but quickly cracked the top five before the halfway point in the race. By lap 25, Schatz had worked his way to second and was closing on the leader. To that point in the race, Schuchart had commanded the top spot with little challenge from any other competitor. Unfortunately for the Hanover, Pa. -native, a red-hot Schatz had him in his crosshairs. Schatz worked his way up to the leader's rear bumper and around Schuchart within six laps to take the lead with just four laps remaining. Schuchart, who was battling a loose racecar by the end of the race, settled into second, as he watched Schatz drive off. Schatz extended his lead over the final laps, as he held off Schuchart and David Gravel to continue his dominance at Weedsport. 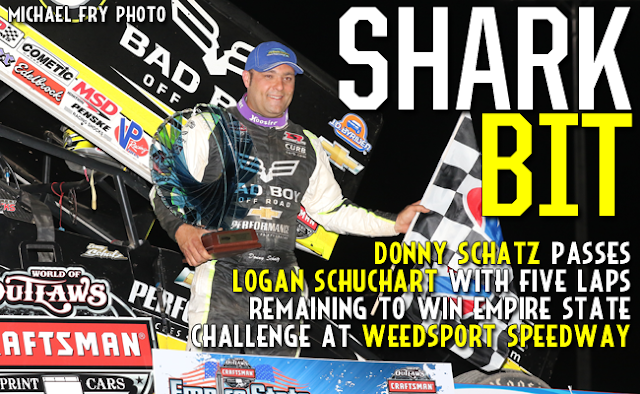 Schatz has now won both series races held at the track since 1993. "We did go back to the notes from last year, but for some reason we can't go back to that stuff, it doesn't seem to work," Schatz said. "If you look at tonight, I think the track record was broke by 23 cars, compared to last year we were rolling around a second slower, so that changes the dynamic of the car a little. You just have to stay on top of it and I have a great group of guys to do that. "I don't know if we have hit our stride yet, like I've said, we gain in one area and make ourselves better but we might lose a little in other spots. It's a challenge, definitely fun at the moment trying to get a handle on it." Schuchart's second-place finish is his third top-five of the season and 10th top-10. "I couldn't tell you [what happened at the end]," Schuchart said. "I got really lose, and before I even saw a numbered car beside of me, I knew it was the 15 car. He's really hard to beat on these types of racetracks and I feel like these are the types of tracks I shine on - when it gets slick. "These guys are tough, so to run second against these guys and just keep getting better is what's important." Since his victory over a week ago at Tri-State Speedway, Gravel, in the Big Game Treestands/JRC No. 5, has admittedly struggled through the Pennsylvania stretch, as he finished 12th and 21st in the two races held in the Keystone State. "We've been running really well, then went to PA and struggled a couple of nights, so it's good to back on the podium," Gravel said. "It was a tricky track here tonight, and we were good at the end of the race. I got to thank all my guys - Austin, Derek, Barry - they worked their butts off on the long haul here." RACE NOTES: Joey Saldana sets a new track record in qualifying at 12.274 seconds...Donny Schatz, after winning in 2015, has now won both series races held at Weedsport since 1993...After leading 30 laps tonight, Logan Schuchart has led the 7th most laps this season with 51. CONTINGENCY WINNERS - MSD Ignitions ($25 cash): Tim Shaffer; MSD Ignitions ($50 cash): Donny Schatz; Penske Shocks ($50 cash): Logan Schuchart; JE Pistons ($50 cash): Shane Stewart; VP Racing Fuels ($50 cash): Greg Wilson; Edelbrock ($50 cash): Jason Johnson; Comp Cams ($50 cash): Jason Sides; Morton Buildings ($50 cash): Brent Marks; Cometic Gasket ($50 cash): Daryn Pittman; Super Flow ($50 cash): Jacob Allen; Craftsman/Sears ($100 cash): Greg Hodnett; KSE Racing Products ($100 product certificate): Donny Schatz; Comp Cams ($50 product certificate): Donny Schatz; JE Pistons (Set of Rings): Jacob Allen; JE Pistons (Set of Rings): Tim Shaffer. SEASON WINNERS: ); Donny Schatz - 7 (Volusia Speedway Park on Feb. 14, The Dirt Track at Las Vegas on March 4, Stockton Dirt Track on March 18, Stockton Dirt Track on March 19, Silver Dollar Speedway on April 2, Lincoln Speedway on May 19, Weedsport Speedway on May 22); Brad Sweet - 6 (Volusia Speedway Park on Feb. 13, Volusia Speedway Park on Feb. 14, Cotton Bowl Speedway on Feb. 26, Ocean Speedway on April 1, Bakersfield Speedway on April 15, Plymouth Speedway on May 13); Daryn Pittman - 3 (Royal Purple Raceway on Feb. 27, Perris Auto Speedway on April 16, USA Raceway on April 18); David Gravel - 2 (Thunderbowl Raceway on March 12, Tri-State Speedway on May 14); Joey Saldana - 2 (The Dirt Track at Las Vegas on March 3, Devil's Bowl Speedway on April 22); Shane Stewart - 2 (Arizona Speedway on March 6, Devil's Bowl Speedway on April 23); Lance Dewease - 1 (Williams Grove Speedway on May 20); Jason Johnson - 1 (Placerville Speedway on March 24); Jason Sides - 1 (I-30 Speedway on April 26). World of Outlaws Craftsman® Sprint Car Series Statistical Report; Weedsport Speedway; Weedsport, N.Y.; May 22, 2016. A-Main - (35 Laps) - 1. 15-Donny Schatz [$10,000]; 2. 1S-Logan Schuchart [$5,500]; 3. 5-David Gravel [$3,200]; 4. 83-Joey Saldana [$2,800]; 5. 2-Shane Stewart [$2,500]; 6. 49-Brad Sweet [$2,300]; 7. 7-Paul McMahan [$2,200]; 8. W20-Greg Wilson [$2,100]; 9. 41-Jason Johnson [$2,050]; 10. 7S-Jason Sides [$2,000]; 11. 19M-Brent Marks [$1,500]; 12. 9-Daryn Pittman [$1,200]; 13. 48-Danny Dietrich [$1,100]; 14. 1Z-Lucas Wolfe [$1,050]; 15. 35-Jared Zimbardi [$1,000]; 16. 5T-Tyler Ross [$900]; 17. 53-Shawn Donath [$800]; 18. 5B-Justin Barger [$800]; 19. 1A-Jacob Allen [$800]; 20. 33-Bryan Holland [$800]; 21. 1F-Stewart Friesen [$800]; 22. 27-Greg Hodnett [$800]; 23. 98-Joe Trenca [$800]; 24. 13X-Tim Shaffer [$800]. Lap Leaders: Logan Schuchart 1-30, Donny Schatz 31-35. KSE Hard Charger Award: 15-Donny Schatz [+8]. Last Chance Showdown - (12 Laps - Top 6 finishers transfer to the A-feature) - 1. 13X-Tim Shaffer [-]; 2. 33-Bryan Holland [-]; 3. 5B-Justin Barger [-]; 4. 5T-Tyler Ross [-]; 5. 98-Joe Trenca [-]; 6. 53-Shawn Donath [-]; 7. 67C-Steven Collins [$200]; 8. 19-Joe Kubiniec [$200]; 9. 13-Clyde Knipp [$200].